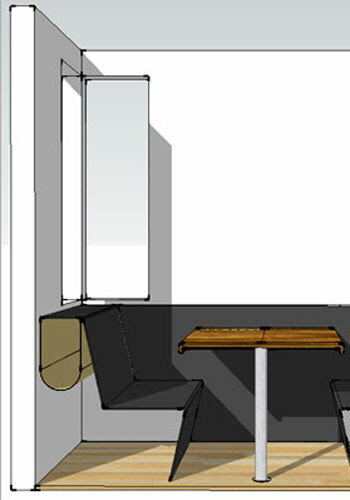 Custom design for a kitchen eating nook. Black patina folded steel plate benches attach to steel wainscoting. A stained mahogany breakfast table sits on a stainless column. The table top slides forward to accommodate different needs of different quests and slides back in place for easy access in and out. Canvas slings under the flat sides hold the morning paper.